Notification No.IV/II(00)/86/ dated 12.12.1986 issued by Association of Indian Universities admitting IGNOU to the membership of AIU. 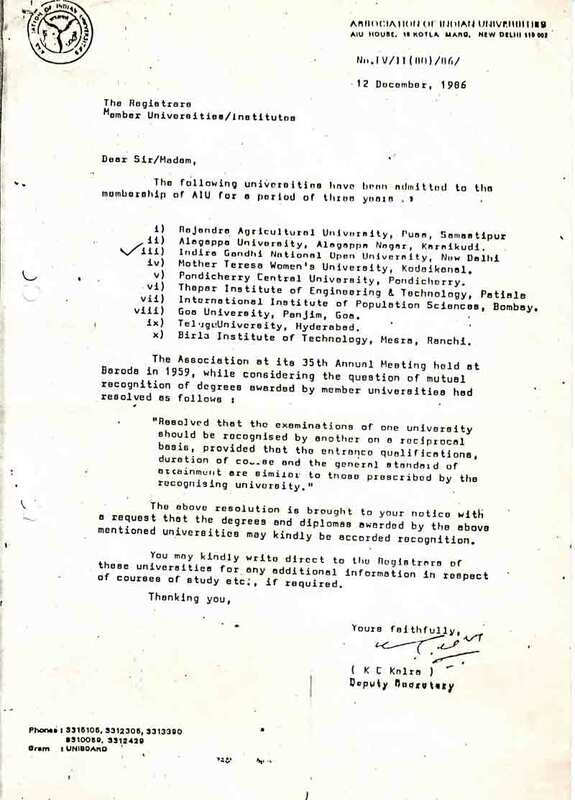 Notification No.IV/II(449)/94/176915-177115 dated 14.01.1994 issued by Association of Indian Universities regarding recognition of Degrees/Diplomas of Open Universities. 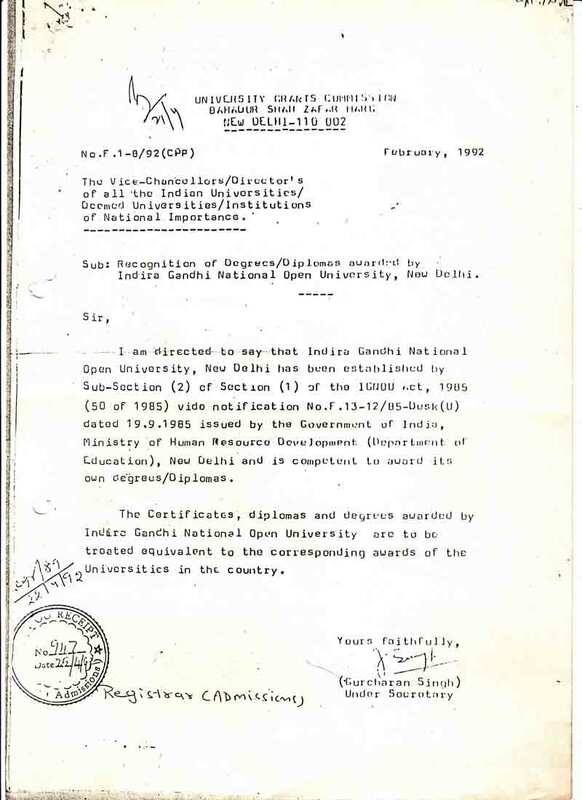 Notification No.F.1-8/92(CPP) dated February, 1992 issued by University Grants Commission regarding recognition of Degrees/Diplomas awarded by Indira Gandhi National Open University. Notification No.F1-52/2000(CPP-II) dated 5th May 2004 issued by University Grants Commission regarding recognition of Degrees awarded by Open Universities. 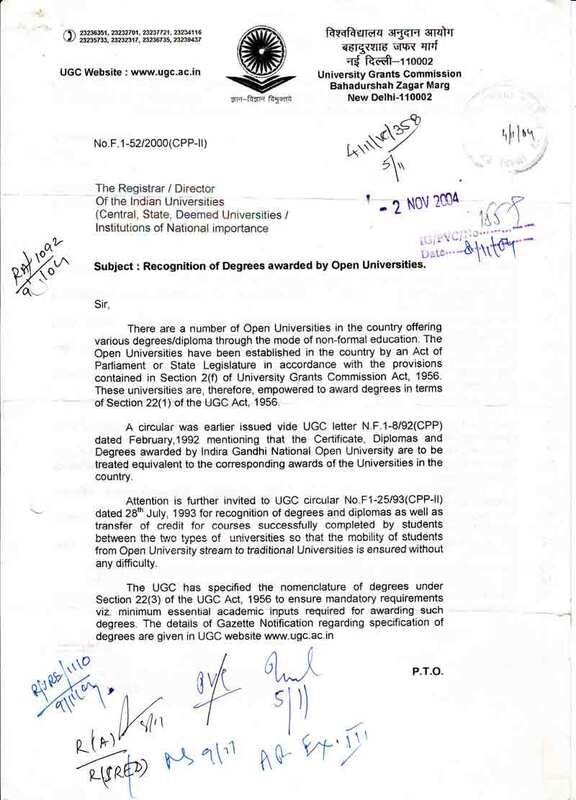 Notification No.F1-52/2000(CPP-II) dated 2nd Nov. 2004 issued by University Grants Commission regarding recognition of Degrees awarded by Open Universities. 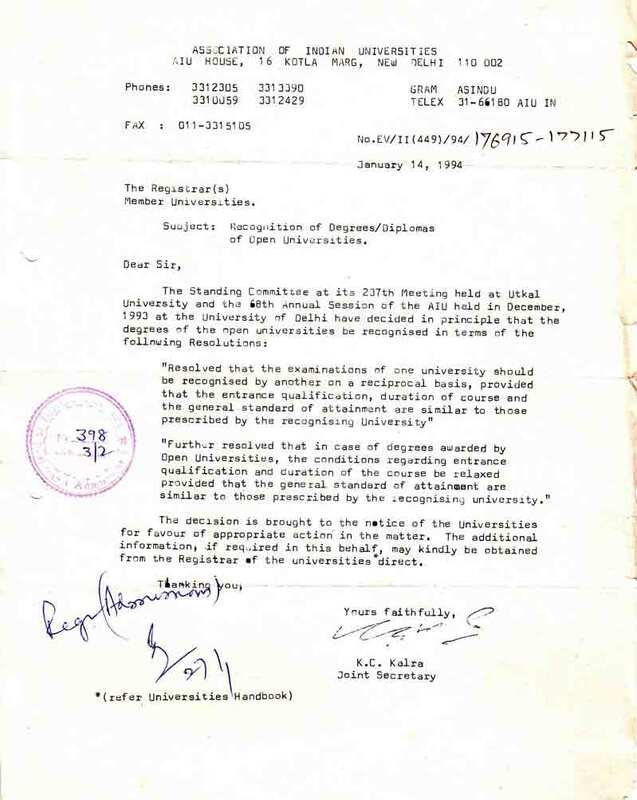 UGC Regulations 1985 regarding minimum standards of instructions for the grant of first degree through non-formal/distance education - Notification No.F.I-117/83(CP) dated 25th November, 1985 . 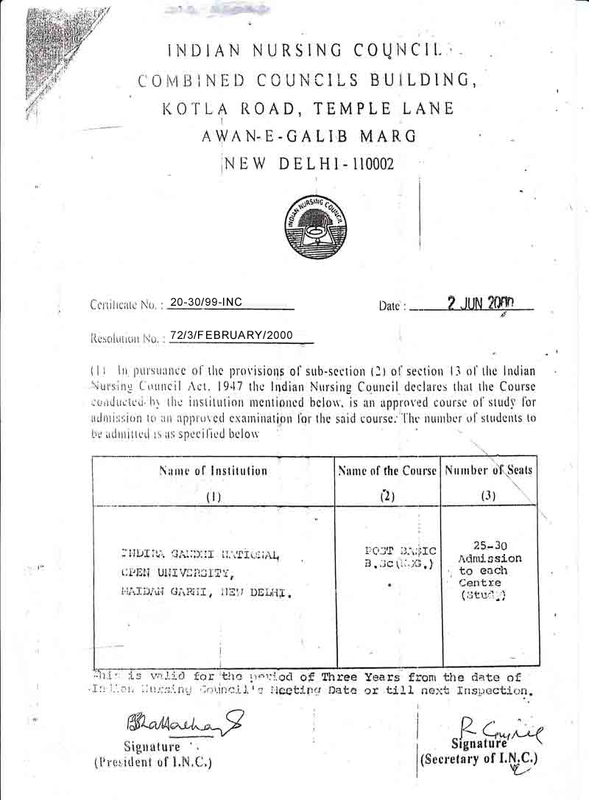 UGC Notification No.F.1-1117/83(CPP-II) dated 18th October, 1995 regarding first amendment Regulations 1995 pertaining to the minimum standards of instructions for the grant of first degree through non-formal/ distance education in the faculties of Arts, Humanities, Fine Arts, Music, Social Sciences, Commerce and Sciences bringing down the age limit to 18 years. 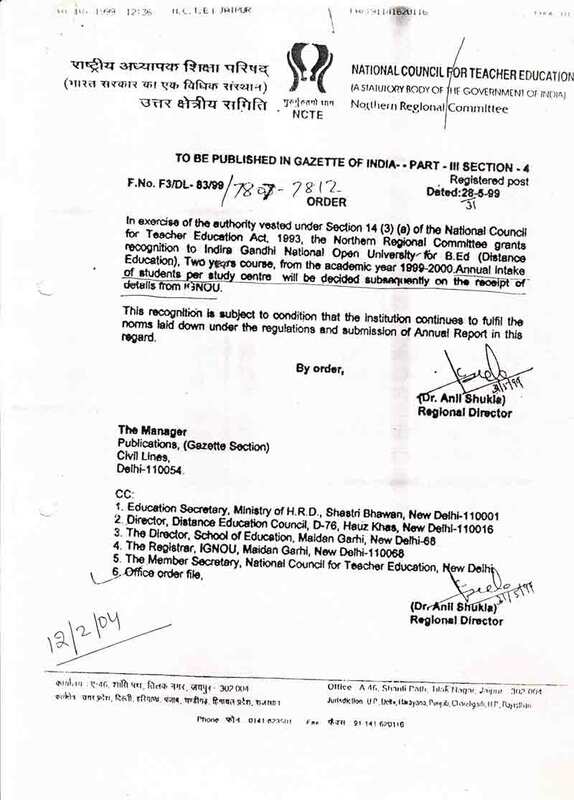 Notification No.F3/DL-83/99/7807-7812 dated 31.05.1999 issued by National Council for Teacher Education, Northern Regional Committee, Jaipur, for publishing in the Gazette of India (Part III – Section 4) regarding recognition of IGNOU’s B.Ed. (Distance Education). 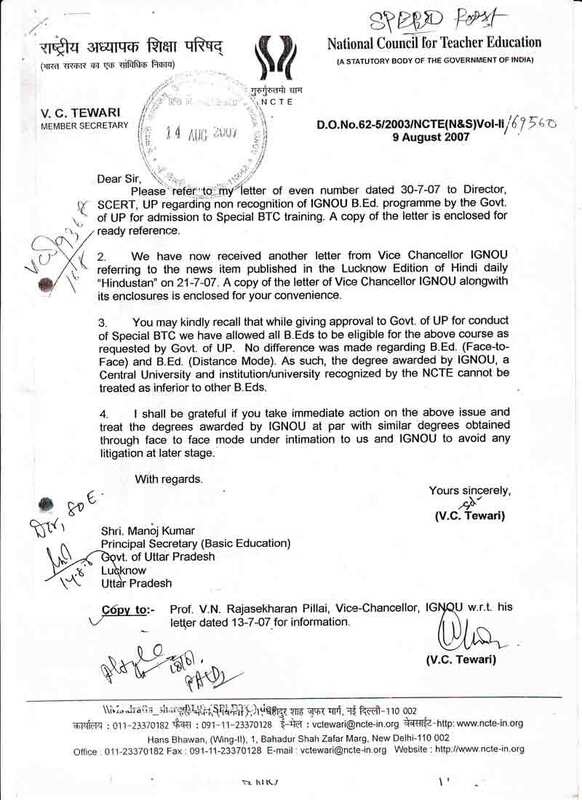 Letter D.O.No.62-5/2003/NCTE(N&S)Vol-II/69560 dated 09.08.2007 addressed to Shri Manoj Kumar, Principal Secretary (Basic Education), Govt. of Uttar Pradesh by Shri V.C.Tewari, Member Secretary, National Council for Teacher Education, New Delhi, stating that there is no difference between B.Ed. (face-to-face) and B.Ed. (Distance Mode). 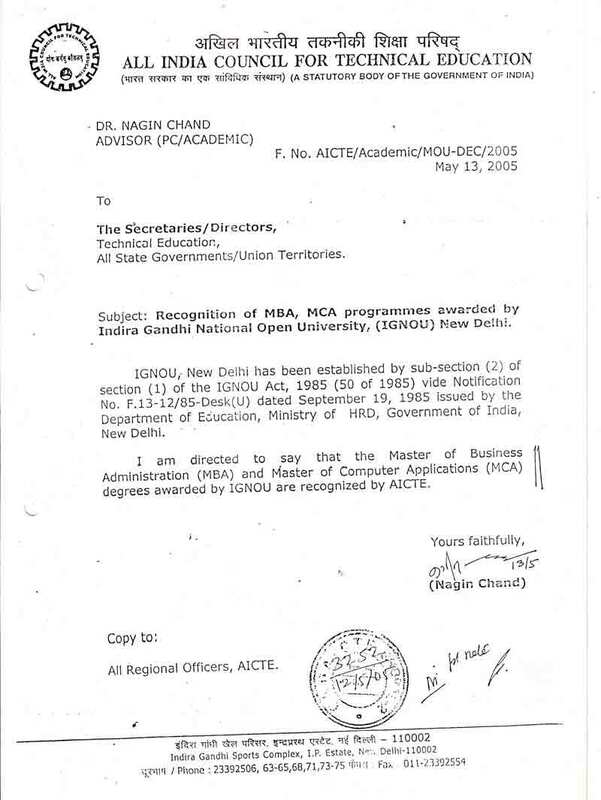 Notification F.No.AICTE/Academic/MOU-DEC/2005 dated May 13, 2005 issued by All India Council for Technical Education, New Delhi , regarding recognition of IGNOU’s MBA and MCA Programmes. Certificate No.20-30/99-INC dated 2nd June 2000 issued by Indian Nursing Council, New Delhi , regarding recognition of IGNOU’s POST BASIC B.Sc. (Nursing) programme. Bar Council of India Circular No. LE Cir. :02/2010 dated 20.12.2010 regarding acceptance of first degree (10+2+3 stream) obtained under ODL for admission to LL.B. Course. 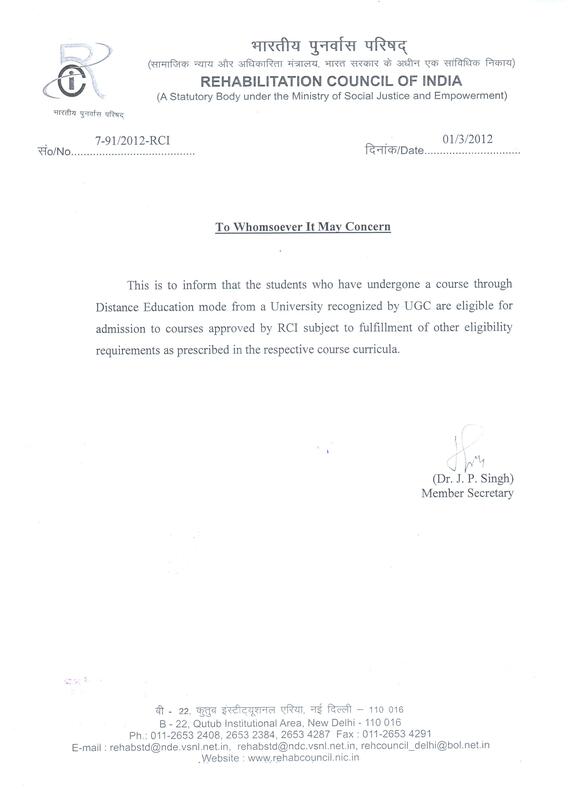 DEC’s Notification F.No.DEC/IGNOU/2011/8435 dated 19/12/2011 regarding recognition of IGNOU Programmes by Distance Education Council.